Dr. McEwen (left), with the winning team of the Quality of Life Prize. V. Saran Photo. Takhti, a long range wireless networking solution for developing communities, was recognized as having the potential to dramatically improve quality of life. Saadan Sulehri, fourth-year electrical engineering student and his non-profit organization - LET’S International Charitable Association, will apply the $25,000 McEwen Family Applied Science Quality of Life Prize to bring the innovation forward. "Thank you to UBC Engineering and Dr. McEwen for promoting education and inspiring us to make a difference," says Sulehri upon accepting the prize. "When tackling some of the biggest humanitarian issues, people are often daunted by the sheer magnitude of the issue. We believe rather than shying away from these issues we should work towards long-term solutions and not waste time in taking the first step. Companies such as Google and Facebook have been working on developing solutions for connectivity in the developing world, but we believe that due to the self-sustainable, affordable and effective nature of our approach, it will be the leading solution in providing educational, medical and socio-economic development. The confidence of the McEwen prize reinforces our belief that we can truly make a difference." The McEwen Family Applied Science Quality of Life Prize was created by the McEwen Family Charitable Trust in recognition of UBC’s and the Faculty of Applied Science’s Centennial year, 2015–2016. 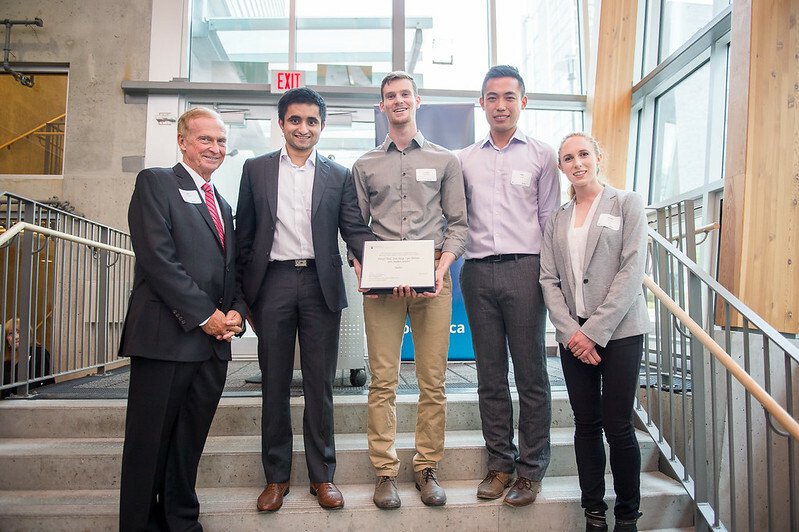 The prize encourages students from across UBC Applied Science to share their efforts to improve community health and safety. It recognizes students for their ideas, products, designs, innovations and/or processes that most improve quality of life. UBC Applied Science is a unique grouping of departments, programs and schools that comprise the professions of engineering, nursing, architecture and landscape architecture and community and regional planning. In common, all programs impact the quality of life of people. The prize is open to undergraduate and masters-level students in Applied Science. Students from Nursing, Engineering, Architecture and Landscape Architecture (SALA) and Community and Regional Planning (SCARP) were eligible to submit product, design or best practice ideas. Along with Takhti, five other Applied Science student inventions were shortlisted for the prize. These finalists were showcased and the winner was announced April 28 at the McEwen Family Applied Science Quality of Life Event held at the Wayne and William White Engineering Design Centre in Vancouver, B.C.